Despite the rain and clouds, the drive to Prince Rupert was very scenic. The road hugs the shoreline of the Skeena River most of the way and we could see that we would be surrounded by mountains if the clouds weren't so low. 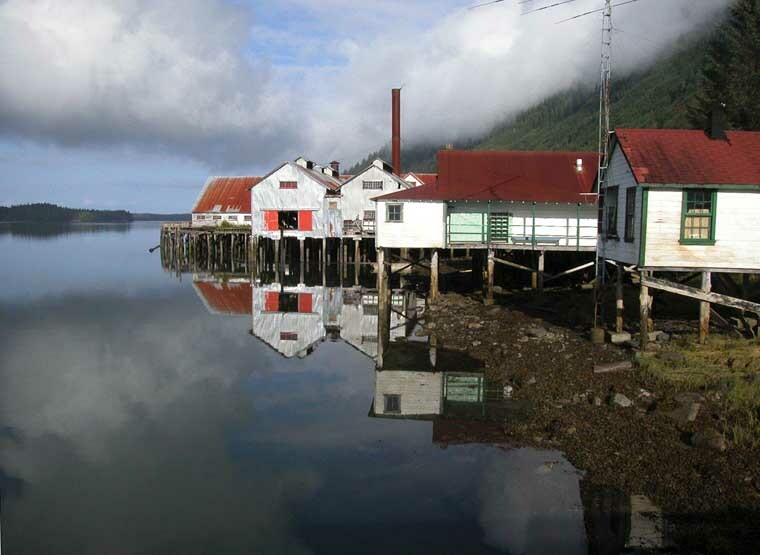 Just outside Prince Rupert is the small town of Port Edward which is home to a historic fishing village and cannery. The tour of the old cannery was really interesting. The cannery started operation in 1889 and continued until 1960. It was amazing looking at the old photos of the workers and hearing how they used to process the fish before any automated machines. In the mid 30's, the cannery was automated with lots of big, noisy machines to make the cans, machines to chop off the heads and tails, gut the fish, chop it up and fill the cans. The machines still work and our tour guide threw a switch and gave us a demo. I don't know which would have been worse - working in the cannery before or after automation. Both were very repetitious and messy but I could not have stood the noise of the machines. And the workers didn't have ear protection then. The rain has continued to hamper outdoor activity so we opted for a visit to another museum - this one the Museum of Northern British Columbia. It was one of the best ones we've seen with lots of interesting displays of the early life of First Nations' people. The museum offered free guided tours describing the exhibits. For a little extra, we signed up to attend a simulated potlatch or celebration feast. We even became members of certain clans - our group was the Eagle clan and Barb played chief. There were dances, story telling and sampling of native food. We tried soapberries but found them quite bitter even though sugar had been added. Then dried seaweed, which they call popcorn. It was crunchy and salty but I'll take our popcorn anyday. Lots of fun and a great way to learn about native culture. Steve and Robbie had planned to take the ferry over to Vancouver Island but were wait listed (no reservations available until Aug.31.) They got up bright and early to be in line at 5:30 am but unfortunately didn't get on. Rather than try again on Monday they decided to hightail it down to Vancouver area as there is a Winnabago dealer there that they hope can fix their slideout. We decided to proceed back a little slower so we said our goodbbyes. We have really enjoyed their company on this trip and will miss our game nights. Terrace lies about 90 miles east of Prince Rupert along the Skeena River. We finally got a break in the weather and were able to see what we had missed when we traveled the route on the way to Prince Rupert. 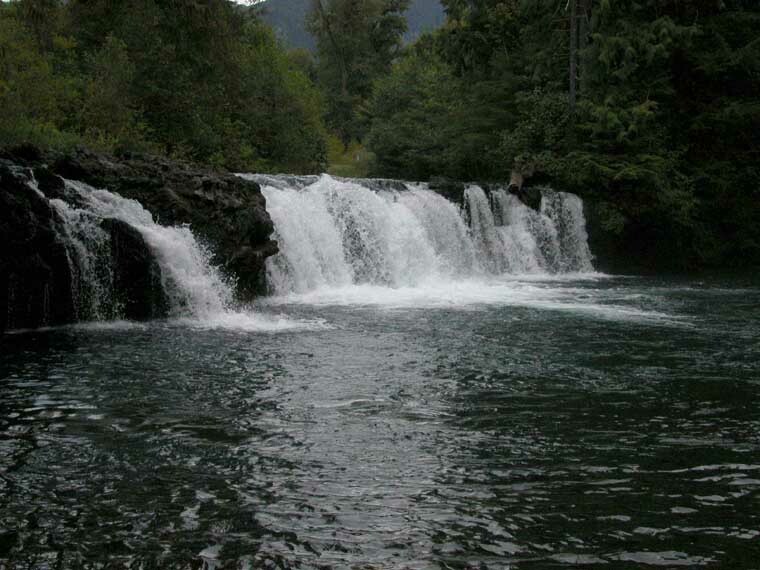 The Terrace area is noted for its salmon fishing and if our freezer wasn't already full we would have tossed in a line. Instead we decided to take two sidetrips by car that were very nice. 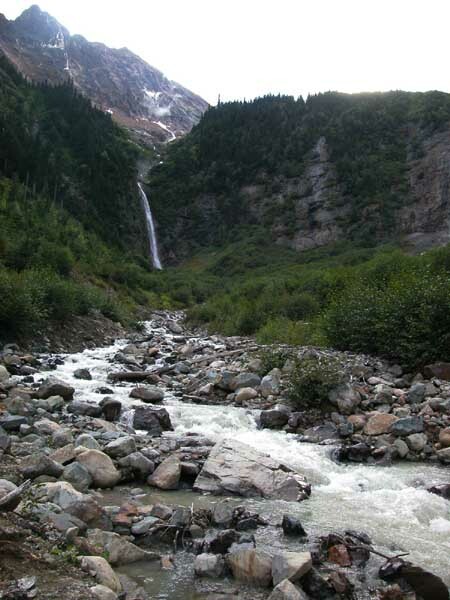 The first was to the Nisga'a Memorial Lava Bed Park about 45 miles north. The volcano that created the beds erupted about 250 years ago, wiping out some Indian villages near its base.We took a couple nice walks onto the lava beds and out to some picturesque water falls. The next day we drove about 30 miles south to the town of Kitimat. This is a planned city that was founded in 1953. The reason for its existence is due to the building of a huge ALCAN factory - the largest in North America. They offer free tours of the complex where you can watch aluminum being made. What a fascinating tour. After a 25 minute video overview, we boarded a bus and drove out to the end of their wharf where we watched the finished product being loaded onto huge ships. The Kitimat port is one of the busiest on the West Coast and is ice free year round. Then the bus entered one of the smelting buildings. We had to leave our watches, credit cards and key alarms behind as the building is electromagnetically charged. The guide handed us a few paper clips and they stood upright on the palm of our hand, proving that everything inside the factory becomes magnetized. The process for making aluminum involves passing an electric current through a powdery substance called alumina. That turns it molten and the whole smelter consists of about a hundred of these furnaces. From the smelter, we proceeded over to casting where they pour the molton aluminum into molds. These are shipped to customers who turn it into aluminum foil, window frames, auto parts, etc. Unfortunately, we couldn't take pictures as cameras would have been ruined! Kitimat also has the distinction of having the largest living Sitka Spruce tree in British Columbia. 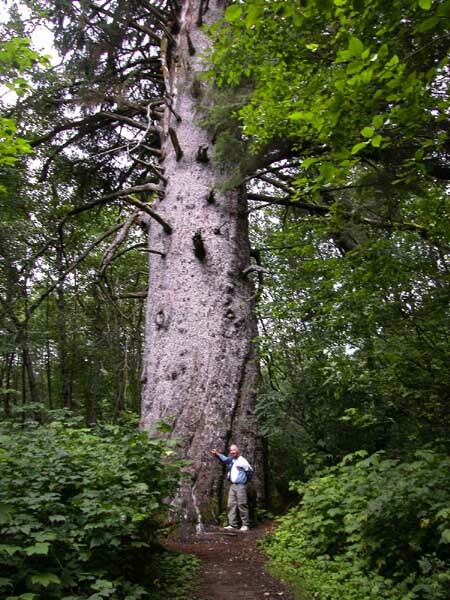 It is over 500 years old and measures 139 feet tall. They say it would provide enough lumber to frame nine average houses. From Terrace it was a short drive to our camp spot for the night, the KSAN campground and museum in Hazelton. This is a beautiful campground run by a First Nation clan. 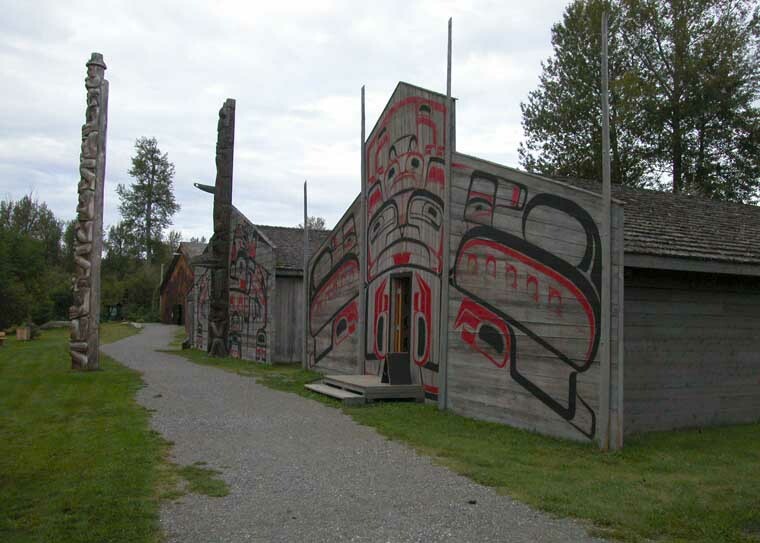 The site also includes a historical village and museum, a replica of a traditional Gitksan Indian village that stood at this site for centuries. 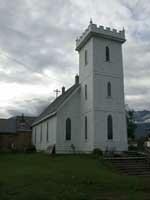 Within walking distance of the campground is Old Hazelton. The town has been reconstructed to look much like it did in the 1890's. This Anglican church was built in 1900 and has the original bell in its tower. We are now in Smithers, a cute town nestled below some towering mountains and glaciers. The storefronts on Main street have been made to resemble an Alpine Village. We took the visitor center's suggested circle tour of the surrounding area and were glad we did. It took us up to the Driftwood Canyon Provincial Park which is the site of some fossil beds in the shale outcroppings along the creekbank. Then we drove along a dirt road (pretty smooth) through farmland. Supposedly you might see wildlife along the way but all we saw were cows wandering across the road. There were some great views of the Glacier and we found some wild raspberries to pick along the route. 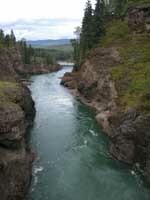 We crossed over the Bulkley River and Moricetown Canyon and Falls where natives were fishing for salmon. 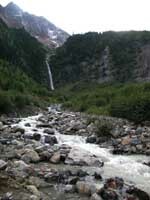 Then drove up to Twin Falls, two magnificent falls that thunder down from the Hudson Bay Mountain and glacier. The whole route took about three hours - a nice way to spend the afternoon. We are now off to Prince George where we've had some mail forwarded. Will be there till it comes.